SAN FRANCISCO, US: Five nonprofit groups got word on Wednesday that Google will help them fulfill visions of using the technology titan's Internet-linked Glass eyeware to do good. "Giving through Glass" program winners were selected from 1,300 proposals from US charities with ideas of how to use the eyewear to achieve their goals. Google will give each group a $25,000 grant along with a pair of yet-to-be publicly released Glass eyewear and guidance from the technology firm's engineers. "Developers are already working with these inspiring groups, and next week these five nonprofits will descend on Google Glass Base Camp in San Francisco for training," Google.org director Jacquelline Fuller said in a blog post. Winning proposals included using Glass to let students see through the eyes of Paralympic athletes to foster empathy for people with disabilities; encourage girls to learn math and science, and improve communication by people with autism, hearing loss, or speech problems. Glass will also be used on a "3,000 Miles to a Cure Race Across America" to raise money and awareness for brain cancer research. Google last month made Glass available in Britain to early adopters willing to spend 1,000 pounds for a chance to dabble with the Internet-linked eyewear. The California-based technology titan expanded an "explorer" program beyond the United States for the first time by inviting British enthusiasts to virtually queue for the gadget online at google.co.uk/glass. The eyewear - hotly anticipated by some, feared by others - became available in the United States in May to anyone with $1,500 to spare and a desire to become an "explorer." 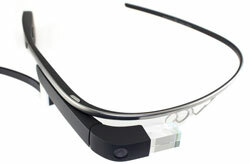 Glass connects to the Internet using Wi-Fi hot spots or, more typically, by being wirelessly tethered to mobile phones. Pictures or video may be shared through the Google Plus social network.